Alpha Kappa Alpha Sorority: Skee-Wee My Sorors! Today my sorority, Alpha Kappa Alpha Sorority, Inc, was founded in 1908 on the campus of Howard University. It is the oldest Greek-lettered organization established by African American college women. I pledged Zeta Alpha chapter at Arizona State University in the 2nd semester of my sophomore and I think it was one of the best things that I have ever done. Surprised that I am a sorority girl? I was surprised myself that I wanted to pledge! I never thought of myself as a “sorority type” because I was artsy and a bit strange, but a friend talked me into going to an information “tea” and I liked what I heard. Truth be told, the existing members didn’t quite know what to make of me when I entered the room for my interview. I will never forget: I wore a long black dress, black boots and a black hat. And there they were…in their pearls and silk dresses. I was out of place for sure! But they took a chance on me (I think I had good recommendations) and every one of them eventually came to love my quirky style. I don’t know if I would have pledged if I had gone to another school or if my experience would have been so great somewhere else, but at ASU I have the best memories. Having been an only child my whole life, I experienced sisterhood like I had never felt before. I lived in the sorority dorm with my sisters and every day was so much fun. My line sister and roommate Sondra became one of my best friends. After graduation we never again lived in the same place and the chaos of life caused us to not even keep in touch that much, but I saw her recently and it was like old times; we sat in a restaurant for 5 hours talking non-stop. There is a bond there created by Alpha Kappa Alpha. I could give you a history lesson about all the community service that the sorority does or how we are dedicated to seeing women succeed in college and beyond, but for me it was all about the sisterhood. 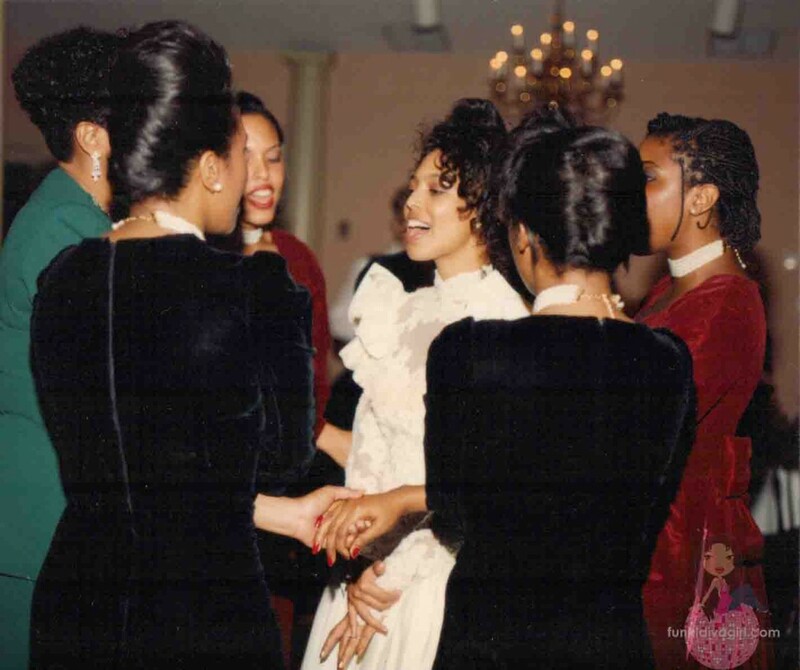 Many of my sorors were in my wedding and one of my favorite memories of that day is when they surrounded me and sang our sorority hymn. That song still always makes me cry. *Dictionary Sidebar: “Soror” is what we call each other and “line sister” refers to the people who pledged with us. Oh, and if you don’t know, “Skee-Wee” is the sound that other AKA’s make to greet each other or just let other people know that we are in the house. It’s really high-pitched and has been known to break glass. And talk about having fun! We threw parties, went to other Greek parties, participated in school-wide Greek functions, took road trips to other colleges and had many late-night pajama parties. Of course there was friction sometimes – have you ever known a group of women to not have friction? But in the end it always came down to one thing: we were sisters. ASU was not a very diverse school, that is to say, the black people were scarce. And it is also one of the biggest schools in the country, an easy school to feel lost and alone in if you don’t have a crew. I was far away from my Minnesota home and I only knew one other person on campus before coming to school; joining the sorority gave me an instant family and a place to belong. And not just in my own sorority. Because most of the other Black Greek Organizations were relatively small chapters like ours, all of us were one family. Of course there was friendly rivalry, but with so few of us at the school, there was no room for dissension. I have many, many fond memories but one of the best is when I got “kid-napped” while pledging. It is not unusual for fraternities members to try to kidnap a pledge and for that reason pledges were never supposed to be somewhere alone. However one night I had to study in the library and for whatever reason, I went alone. When I was done studying I left the library and unlocked my bike to ride back to my dorm room. Just then two members of Alpha Phi Alpha Fraternity (our brother fraternity) surrounded me and I had nowhere to run. Since I was going to be in trouble anyway with my Big Sisters for being kidnapped, I figured that I might as well have fun. I asked them to take me to Haagen-Dazs for ice cream and they did, but when we got there, they only had 7 cents between them! They were broke! I had to buy my own ice cream, can you believe it? It was so ridiculous that I still have the 7 cents taped in my scrapbook. Wait–It gets worse. When they returned me to the library to get my bike, it had been stolen because they whisked me away right after I had unlocked it. And they were too broke to replace it! Eventually I shamed them into scrounging up 1/2 of the money for a new bike and good faith between our respective organizations was restored. And yes, my line sisters and I totally got blasted for my kid-napping. It’s funny now, but it wasn’t funny then. Really I could go on and on with all kinds of stories. It’s funny because many people who have met me after graduate school don’t even know I’m an AKA. I don’t have a license plate and I rarely wear my letters. I’m not currently active in a graduate chapter. I do not feel the need to let people I meet know about this part of my life; more often than not it is my husband who will tell others about my sorority membership. Yet, my sorority is something very dear to my heart. 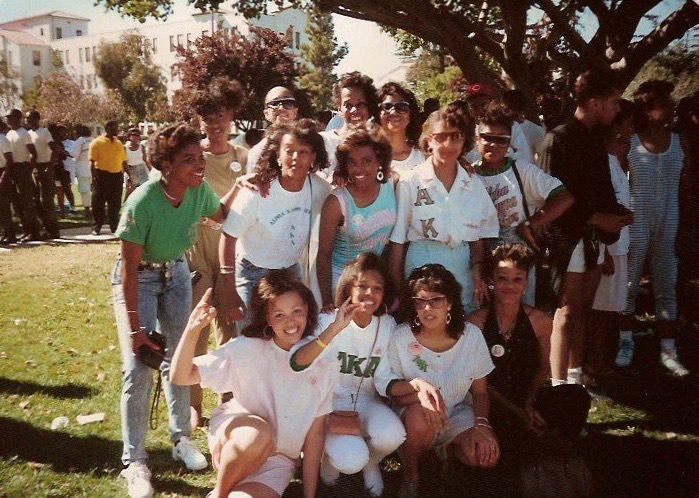 I have fantastic memories of my college years and I know it is because of Alpha Kappa Alpha. Thank you Alpha Kappa Alpha for having a vision more than 100 years ago of sisterhood and service. This quirky, artsy girl will always proudly wear her pink and green. Skeeeeeee-Weeeee! no i understand that and realize how important and sacred it is to the indivisuals in the organization… i was asking are you taught how too once youve been accepted.. hope this clears it up was not trying to disrespect this sorority. Oh…hmm, I’m not sure if you are taught per se because you aren’t required to make that sound once you’re in the sorority, it’s just a fun thing to do. if you dont know how to sound off wjen entering this sororityare you taught how to… i am 18 and just wondering should i know how before pledging. Not appropriate at all to make that sound before pledging! The kidnapping had me cracking up. I would have made the best of it myself. And just so you know, I love your style. Wow…fun times..having flashbacks myself. Happy Founder’s Day!..love the Phirst Pham..06!-08! I totally remember being a pledge back in college. You are right, from the outside it looks silly, on the inside it’s great! Even though it was short lived, it was fun! Didn’t know you went to ASU…cool! Cheers! I know…I totally don’t look like the “sorority-type” LOL. Wow…I can’t believe she pledged Zeta Alpha! What a small world indeed! I’m sure we know some of the same people in Phoenix as most of my friends still live there. Awh congrats I didn’t know you were a AKA! Happy Founders day party hardy! I wanted to pledge but never got around to it in college lol. Happy Founders Day to my favorite AKA!! !